Tired of inconsistent, difficult to manage data? Using Default and pre-formatted fields, your forms can streamline data entry while enforcing consistencies and reducing reporting errors. 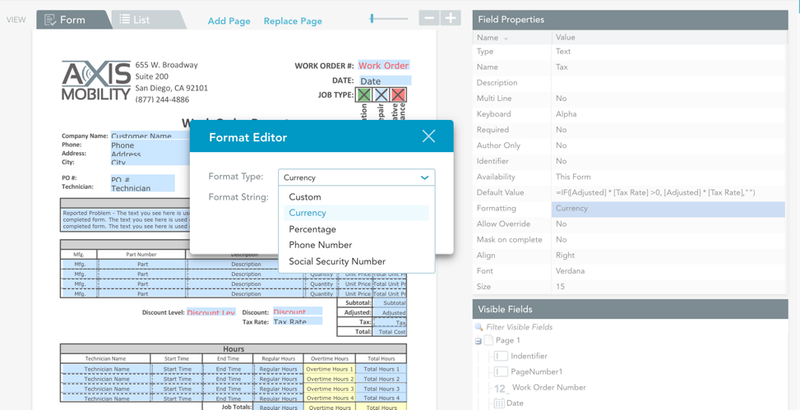 Default values allow template developers to manage the data input for specific fields. For example, a data type often recorded in a variety of formats are Phone Numbers. By applying a Default value within that specific field, Phone Numbers are automatically structured in the manner you see fit –– eliminating inconsistencies, and simplifying data collection. 1. Open your form in the Template Editor. Select one of the formatting options, or add a Formatting String. In this example we will select the Currency formatting. Select the Default Value option. Enter your formula, dictating the behavior of the field. This can tell your field to pull information from another location –– within the form, or from a database. Here we see a formula pulling information from the Tax Rate field. As you explore the Field Properties section, you’ll discover a variety of other formatting options to choose from. From Allow Override to Multiline Text, your attention to detail when crafting your form Templates can lead to more consistent, applicable data. Making life easier for you and your teammates.